1. Preheat the grill to high. Cut the courgettes lengthways into thin slices. Place into a grill pan, spray generously with olive oil and season. Toss to coat in the oil and spread out evenly. Cook for 4-5 minutes on each side, or until softened and golden. Remove from the heat and add the vinegar, garlic, chilli and lemon zest. Spray with more olive oil, season again to taste and mix well. 2. Meanwhile, place the flour into a bowl with a generous pinch of salt and 6-7 tbsp cold water. Mix well with a fork until it starts to come together into a ball then knead lightly with your hands to make a soft dough. Divide into 2 pieces, place on a clean, lightly floured surface and roll each one into an 18cm circle. or until just golden and slightly risen. Repeat with the second circle. 4. Split each circle in half horizontally with a bread knife. 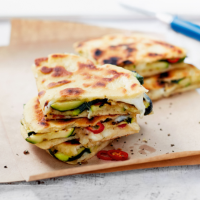 Spoon the courgettes and any juices onto one cut side of each bread circle and top with mozzarella and basil leaves. Top with their other halves and press down gently. Slide one piadina back into the pan, place a large heavy saucepan on top and press down gently. Cook for 3-4 minutes on each side, replacing the pan each time, until golden and the cheese has melted. Keep warm while you cook the second piadina. Cut into wedges to serve. Great with tomato and red onion salad. This recipe was first published in Thu Jun 19 14:58:00 BST 2014.